This is a photograph of a detachment of the German East African Schutztruppe probably taken sometime between 1891 and 1900. 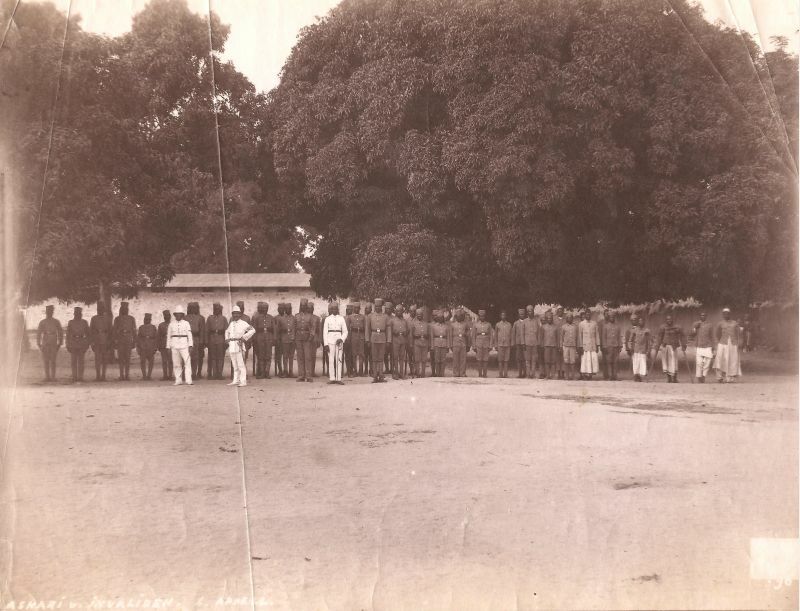 It is not known exactly where in East Africa this photograph was taken though the men are probably the garrison of a small town. The caption simply says "Askari u(nd). Invaliden b(eim). Appell", askaris and invalids on roll call. 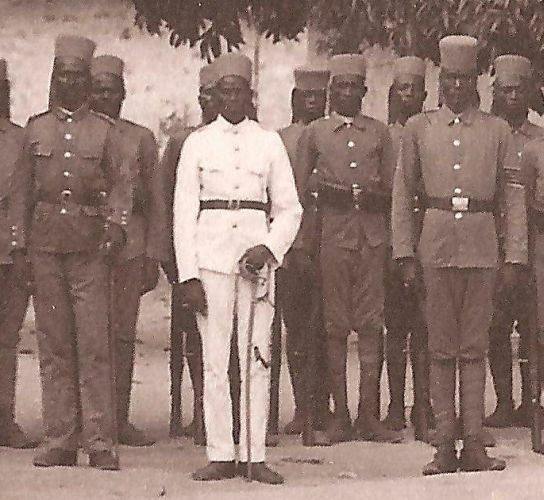 The unit presents a total strength of two German NCOs, two African officers ("Effendi"), one Askari Sergeant Major ("Sol"), six Askari junior NCOs on the far left, twenty-two askari riflemen and a further twenty-one unarmed Askari on the far right. These unarmed askari may be a combination of gun carriers, German NCOs' servants or cooks. At least one is an NCO himself and four are invalids on crutches. A close up of the photograph showing two German NCOs in the foreground. They are both wearing the 1891 Schutztruppe White Tropicl Uniform with their distinctive crown buttons on the collar, Brandenburg style cuffs and large curved rank chevrons. The NCO on the left wears the single white metallic lace chevron of an Unteroffizier, the NCO on the right wears the three chevrons of an Feldwebel. They wear white tropical helmets with imperial cockades on the front. This style of uniform was worn until replaced by new regulations as of November 1896. Both NCOs carry swords whereas only the Feldwebel is entitled to according to the 1891 uniform regulations. Other photographs of this period show lower ranking NCOs also carrying swords. The Feldwebel can clearly be seen to have an officers sword knot ("Portepee") as befits his rank. The Unteroffizier's sword knot cannot be seen. 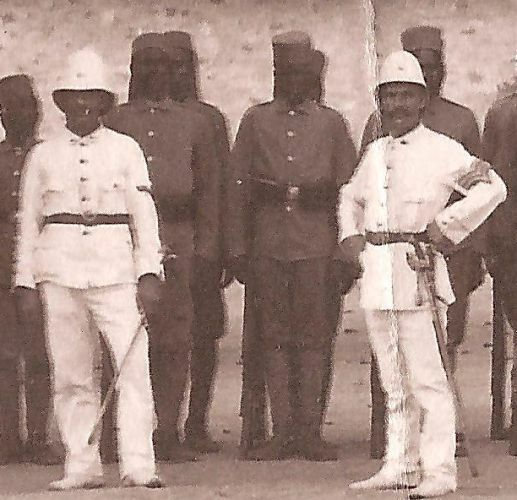 Another close up of the photograph showing the askaris and their African Officers ("Effendi"). The three foreground figures are from left to right, two Effendi and an African Sergeant Major ("Sol"). The Effendi on the left wears a khaki uniform similar to that worn by German officers with Brandenburg cuffs and four pockets. His plain khaki shoulder straps have a number of stars to denote his exact rank. The number cannot clearly be seen but may be one ("Leutnant"), two ("Oberleutnant") or three ("Hauptmann"). Later all Effendi wore three stars and were of equal rank. He does not appear to have crowns on his collar as the German NCOs do. He wears matching khaki trousers worn loose over short brown leather ankle boots. He wears an askari tarbush without imperial eagle. He caries a sword from a brown leather belt with an open buckle. The Effendi in the centre wears a white uniform similar to that worn by German officers with and four pockets. The cuffs appear to be plain. His shoulder straps cannot clearly be seen but may have a number of stars to denote his exact rank. He does not appear to have crowns on his collar as the German NCOs do. He wears matching white trousers worn loose over short brown leather ankle boots. He wears an askari tarbush without imperial eagle. He carries a sword from a brown leather belt with an open buckle. The Sol on the right wears the same uniform as the askari other ranks behind him. It is typical of the appearance of askaris in the early 1890s and consists of a simple khaki tunic with a stand and fall collar, plain shoulder straps and cuffs and five buttons up the front. The trousers are matching khaki with dark blue/grey puttees and short brown leather boots. Plain khaki tarbushes are worn without insignia. All wear brown leather belts with plain brass belt buckles. The Sol is distinguished by four rank chevrons on his upper left arm. While the askaris behind him carry 1887 ammunition pouches and Jägerbüchse 71 rifles with S71/84 bayonets. 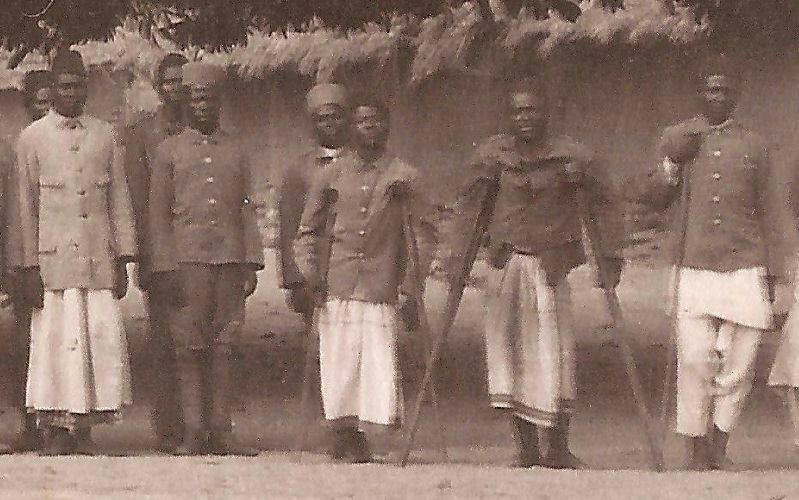 Another close up of the photograph showing askari invalids on the right of the original photograph. They wear a mixture of uniform and civilian clothing. Some wear the red off duty fez. The invalids all seem to be suffering some kind of foot injury or lameness. They may well be are victims of one of many parasites which in East Africa can cripple the barefooted. Ernst Nigmann's "Geschichte der Kaiserlichen Schutztruppe in Deutsch Ost Afrika" (in English on Battery Press) describes how the Germans did trials with men in barefeet (which the askaris often preferred), sandals and boots. They found boots offered more protection and therefore produced less men out of action. Boots were then insisted on and regular inspections made of the men's feet. But from period photographs it seems there were some who went barefoot at times. Conversely it is always possible that these injuries were caused by long marches in ill fitting boots. Please respect the generosity of Karsten Herzogenrath in sharing this photograph with us by not reproducing it without prior permission. Please contact me here if you have other photographs of the German colonies or the soldiers and sailors that served there. I am especially keen to hear from people with family photograph collections and am always happy to try to assist in identifying uniforms, units, places and dates for family history research.